Stay Informed with DOJ's PKO Podcast! Need Additional Resources for Online Safety - on your schedule? The PKO Podcast is being brought to you by the Wisconsin Department of Justice, Internet Crimes Against Children (ICAC) Task Force. Each episode is approximately 15 minutes, is hosted by ICAC experts Dana and Carl, and discusses topics like “App of the Week,” tips for combating online child exploitation, cyberbullying, and healthy online habits. ...And MORE! Join us for future episodes, and connect with us on ProtectKidsOnlineWI.gov if you have suggestions or questions for future podcasts. Stay informed, and keep them safe! 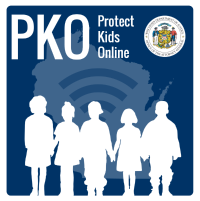 You can download or listen to the PKO Podcast at protectkidsonlinewi.gov or through iTunes, Google Play, or your favorite podcast player.